1. Connect your video camera to the power supply and then connect it to your PC using a Firewire or USB cable. If you have a choice, we recommend using a Firewire cable because the transfer rate is better. 2. Turn on the camera and wait for Windows Vista to detect and install the appropriate drivers. 3. Don't forget to rewind the videotape to the beginning of the movie you want to save on your computer. From the "Autoplay" menu select "Import Video". 4. Now you have to enter the name, the import folder and the format of your movie. We recommend using AVI (single file) since it offers very good quality output for movies. Once you have finished entering all these details, click "Next". 5. 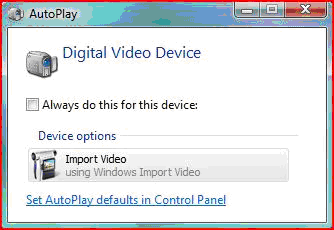 Windows Vista will ask if you want to import the whole videotape or just parts of it. Choose the option that you prefer: "Import the entire videotape...", "Import the entire videotape and then burn it to a DVD" or "Import parts of the videotape...". 6. If you select the first or the second option, click "Next" and the transfer will start. If you select the third option, after you click "Next" you will have to click the "Play" button. Windows Vista will start to import the movie until you hit the "Stop" button. If you want to record another part of the movie, rewind the tape to the starting point of that part and click the "Play" button again. 7. After the importing process is completed, you can see your movie by opening Windows Photo Gallery and selecting "Videos" from the left menu. That's it. You should have all your movies listed on the right, just like in the above image. If in the previous menu you selected the second option ("Import the entire videotape and then burn it to a DVD") the burning process will start automatically. Note: for this guide we used a HP Compaq nx7400 desktop and Sony Video Camera, model DCR-HC24. So I have Vista now, also. So I have Vista now, also. I may not have a digital camera, but I suppose that this is part of my problem, other than Vista, itself. With my situation, I've got one USB Serial Cable for my camcorder. So it has VHS. So what? If now I've got it connected thru the USB2.0, then--in my opinion--that should be enough. This is not the case with Vista. From as much as I know when using Windows Movie Maker, there's only one option for camcorder source--digital camera, which I don't have. Perhaps, I might benefit from searching the web for other movie programs. Then, I'll try--again--with Vista. Good luck with your Sony situation... wish I could have been more help. I also bought a new PC with Vista and discovered it didn't support the Sony DCR-HC24. i decided to get a firewire card and connect it this way. I've tried the software that came with the firewire card, Windows Movie Maker, and WinDV, all with the same result. Please help with this as it's really annoying? 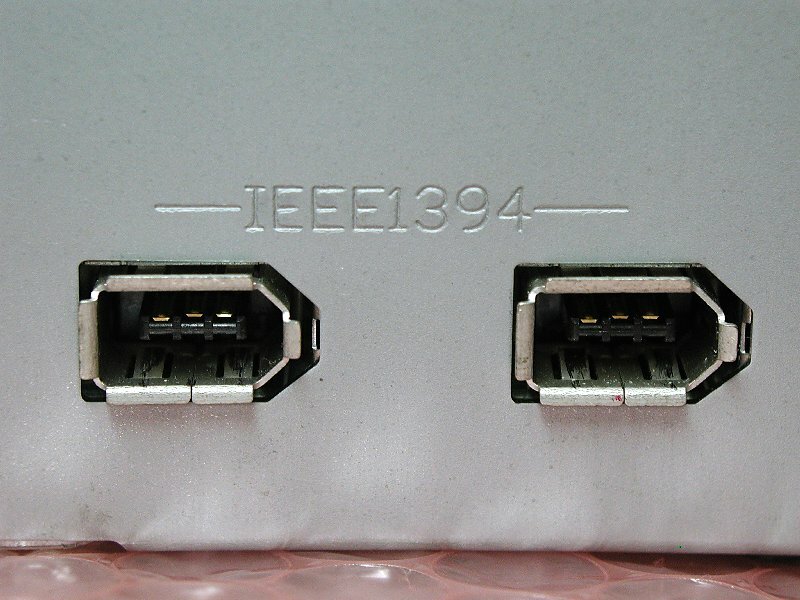 Could the type of firewire cable have anything to do with this? I have had the same problem with the USB cable. Vista isn't detecting the camcorder at all with the firewire or USB. I have had the same problem with the USB cable. Vista isn't detecting the camcorder at all with the firewire or USB.-that makes three of us. help! I have discovered , from several cameras and PCs, that current vista home premium, does not support certain canon minidv camcorders on firewire (and probably others as well) but does support some older cameras. it is also critical what exact update level you are on. I had it working on one desktop fine, but then when i ran windows update as had not done for some months on that pc, and updated about 12 important updates, after that it stopped. I have been seaching all over the web but seems a very common problem. I can only hope microsoft do another update and cure the problem. ok umm i kinda have a similar problem. i just got a vista laptop and you know how theres a camera at the top of it when you open it up?? well, ive tried EVERYTHING to make it work and i even plugged in my flip video camcorder that came with it but NOTHING happens!!!! SOMEONE!, HOW do i make the built in camcorder work?!?!?!?!? nobody i know has a vista computer and my parents are such idiots they barley know how to use vista and i really want to know how to use that camcorder again. SOMEBODY PLEASE HELP ME!!!!!!!!!!!!!!!!!!!!!!!!!!!!!!!!!!!!!!!!!!!!!!!!!!!!!!!!!!!!!!!!!!!!!!!!!!!!!!!!!!!!!!!!!!!!!!!!!!!! What type of camera do you have (model, producer) ? Importing an entire videotape from my digital camcorder is no problem, but the option to import part of it does not appear. Any idea why not? When importing "Video from a digital camcorder" the only option offered is to import the entire videotape. The tape runs for 60 minutes and I only want a short part (2 minutes) but the option to import part of the videotape (explained in this atricle) does not appear. Can you suggest why this might be please? 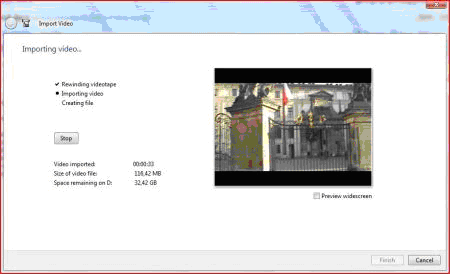 I am running a Dell 9200 desktop, with Dell's version of Vista HomePremium (incl Moviemaker v.6.0.6000.16386) connected to a Canon HV20 HiDef digital camcorder. If your camera has some specific software you should try to use it. Also, you could try to import your videotape with VirtualDub (freeware, easy to use) or Adobe Premiere (expensive and complicated). My Vista PC will not recognise my Panasonic GS27 Mini DV cam - It thinks it is a web cam. When I go onto the Panasonic website, I can find any drivers? When I go into the device manager, neither a web cam or Mini DV Cam appears? 1) Where I can get Panasonic drivers for my mini dv cam - Assuming they exist? 2) How I get the the on screen display (on my mini dv cam) to change from web cam to the correct display for transferring movies? Hey, I have a Sony DCR-HC24E. My laptop is running Vista, and when I try to install the camera it just can't locate the drivers or anything. What can I do, as I desperately need to get the video off of it ! Download the drivers for your camera from the Sony website and install them. I had to rewind the movie before I got the prompt for the movie name, but once I did that it worked great. I have been trying to copy off all my MiniDV tapes to the Vista computer. I have a JVC GRD-72U video camera. I found by reading different blogs, you have best success by getting a Belkin Firewire 800 PCI-express card which has Vista Drivers, $40 then I had to get the right cable $12 and it worked perfectly just like you state in this blog. Thanks for the tips. God bless.. I connected my camera with a USB cable and its not detecting it.I do not have any idea why? I think you should check if the appropriate drivers were installed for your camera. I understand there are incompatibility issues with Vista & certain DV camcorder models. The question is, now what do I do to upload my videos to my Windows Vista computer from my Sony digital 8 handycam (model DCR-TRV250)? Help! Using a samsung minidv through firewire to Vista movie maker. Preview looks great and the recording seems to go fine. First thing that seems odd is the video imported counter is running very slowly like 1 second for every 30 seconds of video. The preview on the screen looks normal. When its all done and I look at the file. It is indeed very short and looks like it was imported using fast forward. Please assist. In the packaging of your camera you will find the producer and the model. Write them down and search for Windows Vista drivers specific to your camera model. Once you download them, install the drivers and connect your camera again. How did I do it? Went to my local PC World and tested the connection on one of their Vista machines - it also didn't work. So I then knew it wasn't my laptop. I'm was thinking it may have been my camcorder that was faulty, but just to be sure I bought a new iLink cable that was 4x the price of the Sony one I got from Amazon. And it works a treat!